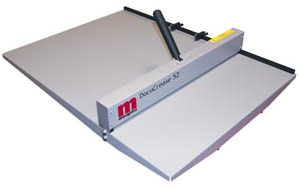 13.7795 inch and 20.4724 inch hand creaser designed for small volume applications, the Morgana DocuCrease is a hand operated machine, which has adjustable stops for multi creasing down the sheet. Like the fully automated Morgana AutoCreaser, the DocuCrease has been designed to overcome the cracking problems encountered when trying to fold material from digital or litho based print engines. The new digital machines often use toner, which will crack on the material, particularly if the grain is running in the wrong direction. The Morgana DocuCrease is the perfect low-cost solution to these problems. This creasing action is a process proven to eliminate cracking of the most difficult materials. Applications such as creasing glossy covers, stocks or materials with the grain running in the wrong direction prior to folding or booklet-making, cover stocks that have been produced by litho or digital printing processes using toner or ink, xmas or greeting cards, invitations, menus, laminates or covers prior to thermal adhesive binding.